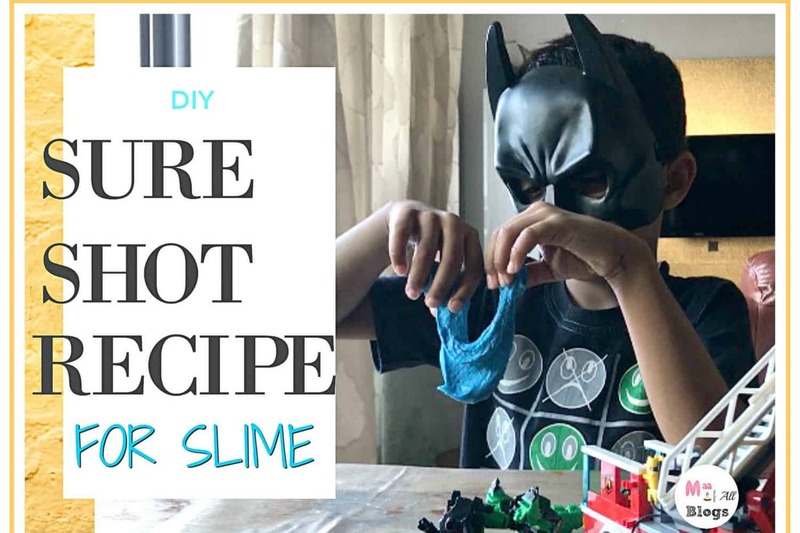 While some of us may not be aware slime is great for sensory play and for your kid’s development. It’s fluffy, stretchy, non-sticky and gooey which makes it a plaything and perfect for sensory play. 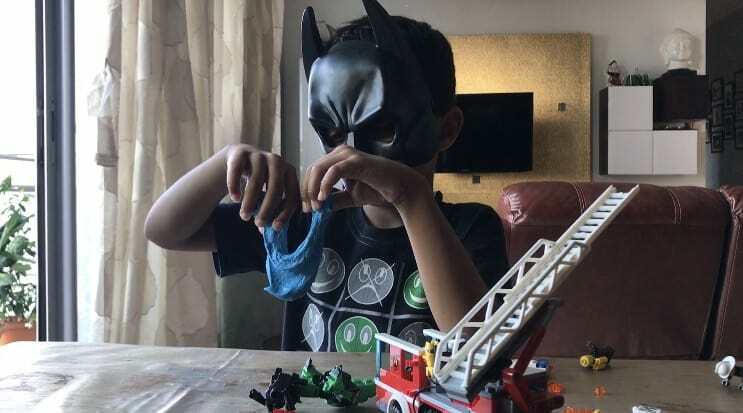 Last year when we bought the kiddos slime on our way out from Singapore and packed it in a plastic box in our bags we had no idea how it could lead to a disaster too. The plastic boxes got smashed and slime was all over our new shoes, bags and husband’s new suit. 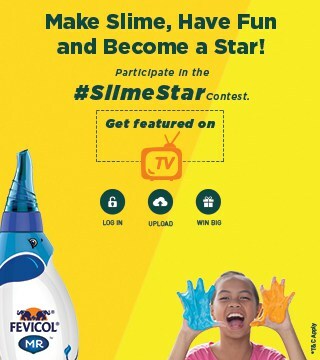 But now thanks to Fevicol, we have an easy way to make slime at home and I will make sure not to carry it around! While nothing will happen even if they throw the slime on your fabric sofa do not sit on it for sure. The kids got all excited when I told them I had a sure shot recipe for slime. We gathered up a few common household items and got to work. It was a great bonding session with my kids although it took a couple of tries to get it right. 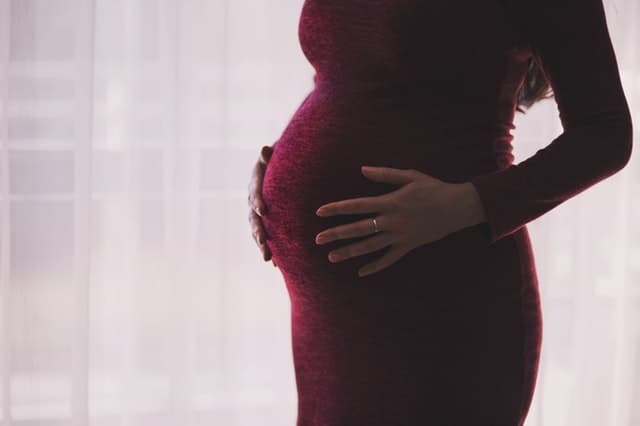 My advice for mothers- Turn it into a fun science experiment and go for a few trial and errors till you perfect the proportion! 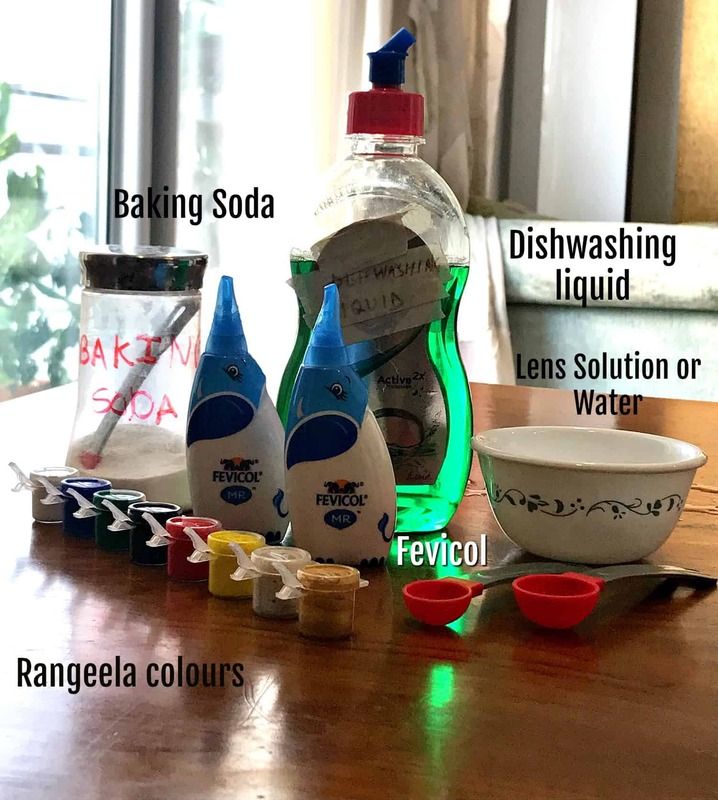 Fevicol MR, Rangeela Tempera Colours, Concentrated Liquid Soap for utensils, Baking Soda, Contact Lens Solution or Carrom Board Powder, Spoon, Bowl. Take a bowl add 100 gms of Fevicol MR. Mix any Rangeela Tempera Colour of your choice. 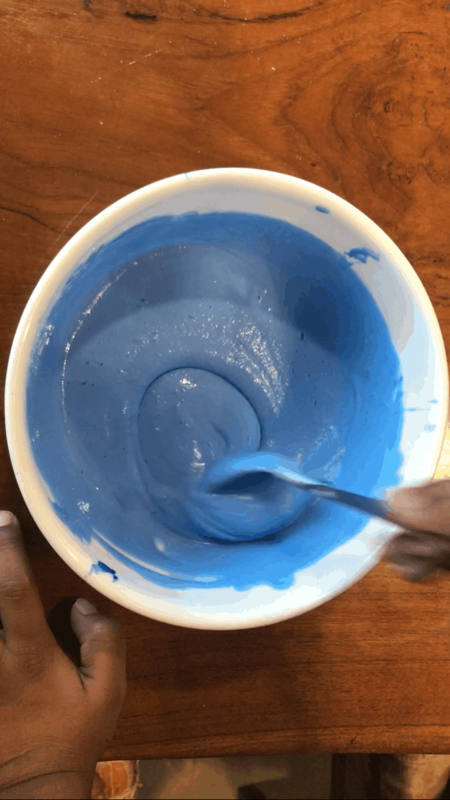 Use a spoon to form an even mixture. Add the concentrated liquid soap, (2tsp) to the Fevicol mixture. Stir well. 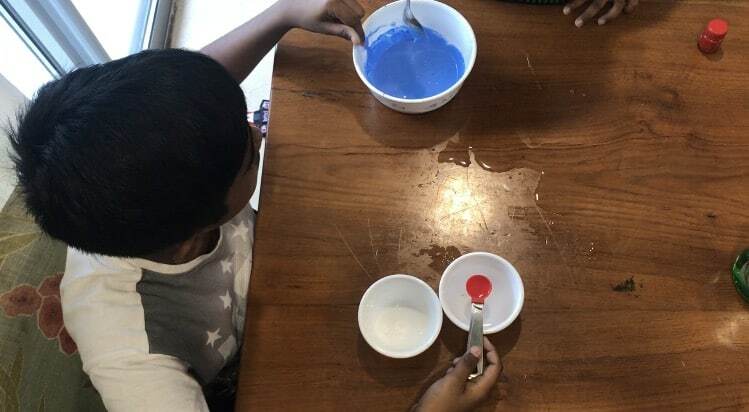 Take another bowl and slowly add a small amount of baking soda or Carrom board powder (½ tsp) and water (or lens solution) (4tsp) and stir well again. Let the solution rest for some time. Now add one tsp of the baking soda or carom board powder solution to the Fevicol mixture. Stir well. Your slime is ready !Stretch, knead, squish and play around. For variations to the basic slime, you could add more elements like glitter, different colours, beads, theromcal balls, whatever comes to your mind. After finishing it, keep it in an airtight box and if it gets hard try quickly running it under warm water and kneading it again. 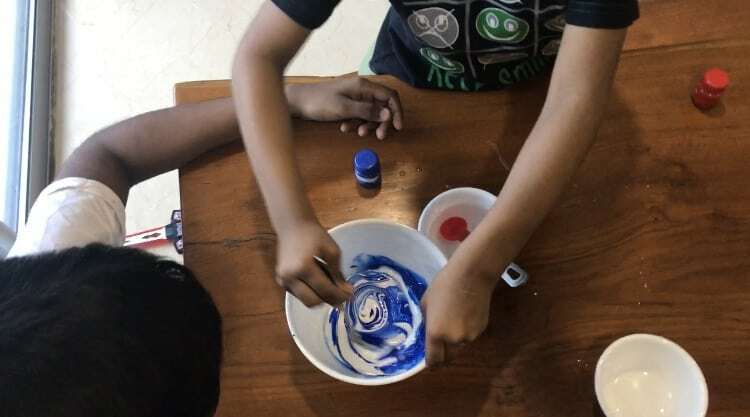 Participants need to make Slime, play with it, and share a fun video or image of how he/she made it or played with it. Fevicol needs to be used in making Slime. The contest will run till the 10th of July 2017. There will be 5 winners in total who will be selected to get featured on TV. Wow!! – A shortlist of entries will be made by Hobby Ideas jury. 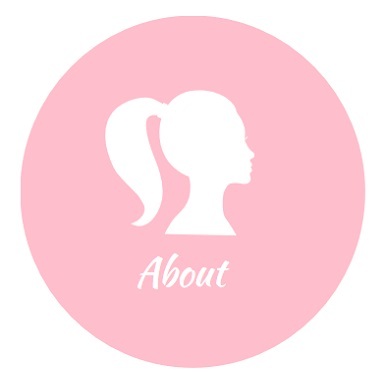 The shortlist criteria will be the quality of the image/video, and how creatively it is shot. 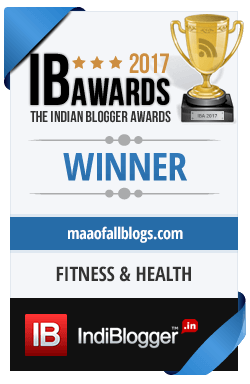 – Weightage will be given to those who submit videos. 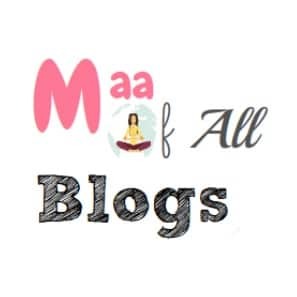 – Once the shortlist is created, winners will be chosen based on a lucky draw. Additional weekly winner categories may be announced basis criteria announced on facebook.com/HobbyIdeasIndia. The prize amount and criteria for these will be separately announced on the Facebook page. All winners will be contacted individually. 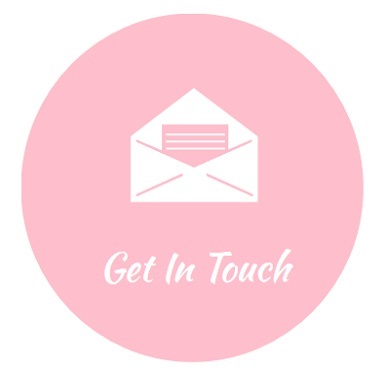 So, please ensure that you fill in the correct contact details in your profile. So get going and have a blast with your kids. NOTE: This recipe is not edible. Have you seen all the slime recipes floating around online recently?